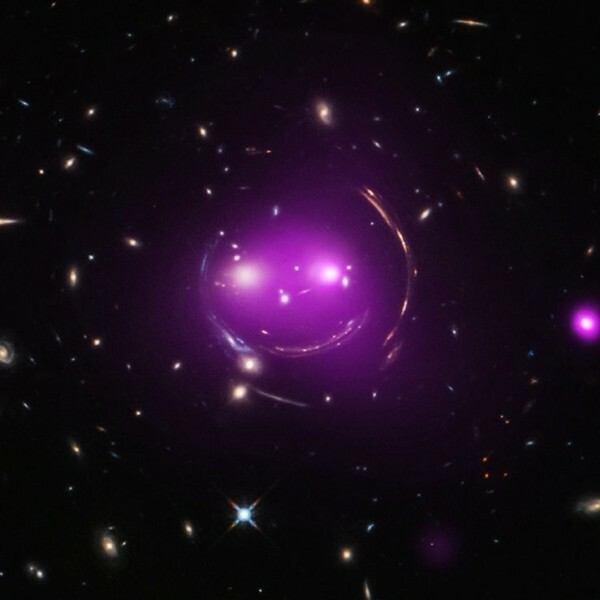 A composite image – combining x-ray and optical images – of the Cheshire Cat group of galaxies. Optical image from from NASA’s Hubble Space Telescope and x-ray images from Chandra X-Ray Observatory. …the mass that distorts the faraway galactic light is found surrounding the two giant ‘eye’ galaxies and a ‘nose’ galaxy. The multiple arcs of the circular ‘face’ arise from gravitational lensing of four different background galaxies well behind the ‘eye’ galaxies.